“La Sérénelle” offers you the peace and tranquility you are looking for. Situated in a peaceful corner of the historic village of Villars, in the heart of the Dordogne, on the edge of the The Parc Naturel Régional du Périgord. 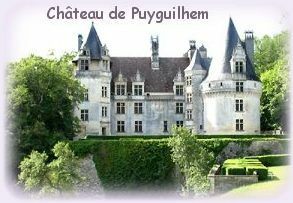 This traditional stone “Maison de maître” formed part of the 16th century beautiful Château de Puyguilhem which is situated nearby. Comfortably sleeping 4 people this exquisite property offers more than most. The Maison de maître is beautifully furnished with furniture in keeping with the property's period and region. Along with its own secluded 11x5m swimming pool, in private gardens, La Sérénelle oozes charm and character. The Perigord is readily accessible with flights direct from the UK to Limoges and Bergerac. This beautiful region in South West France offers you many wonderful delights. With the many local touristic opportunities La Sérénelle is the ideal base to explore the numerous quaint villages, historic caves, outstanding French châteaux and restaurants. Of course those of you who wish to just relax and unwind then this beautiful french property will allow you to do just that. A warm welcome awaits you at La Sérénelle.